Concrete Man was a robot who took charge in constructing dams. He greatly prided his craftsmanship, and berated any worker robots he discovered cutting corners. Originally a robot stationed in a weather control center. With the ability to create powerful tornadoes, he used them to offset the formation of typhoons. Splash Woman rescues those involved in accidents at sea. A line inspection robot at a television set factory. He carries out the final check on the products with a sharp eye. A robot that works in a diamond mine. He is in charge of polishing work with his skilled fingers. Hornet Man is the supervisor at a flower theme park. He knows everything there is to know about flowers from all over the world. Once a worker security robot at a geothermal power station, he can withstand magma thousands of degrees in temperature. An assistant robot at a space laboratory. He has a brain that can instantly perform calculations of rocket trajectories. 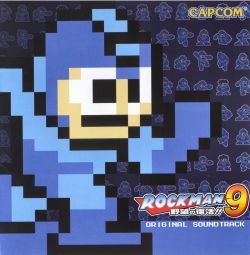 Mega Man 9 / ロックマン9 野望の復活!! / Rockman 9: Yabou no Fukkatsu! !